Jake takes a rare break. No time to chat. Jake has got a busy work schedule. The industrious feline is an irreplaceable member of the staff at the Fort Collins Cat Rescue (FCCR). The multitasking manager is a certified therapist cat, official shelter greeter and celebrity all rolled into one. Life didn’t always look so promising for the beautiful Korat kitty, a former stray. He was returned to the animal shelter three times. However, he found his niche at the FCCR and flourished as its resident cat. He takes his jobs very seriously. The Loveland Reporter-Herald reported that Jake, in his capacity as therapy cat, visits the local library to participate in story times with children. He also provides comfort for senior residents at nursing homes who love having him there. As official greeter at FCCR, the Reporter-Herald said, Jake welcomes all new cats that arrive at the shelter. “He sits next to their cage and calms them,” said Mary Wolf, the shelter manager. Jake’s many roles did not go unnoticed. He was featured on Animal Planet's Cats 101 after a producer saw a post about Jake's unique story on the blog, Writing Outside the Barn. 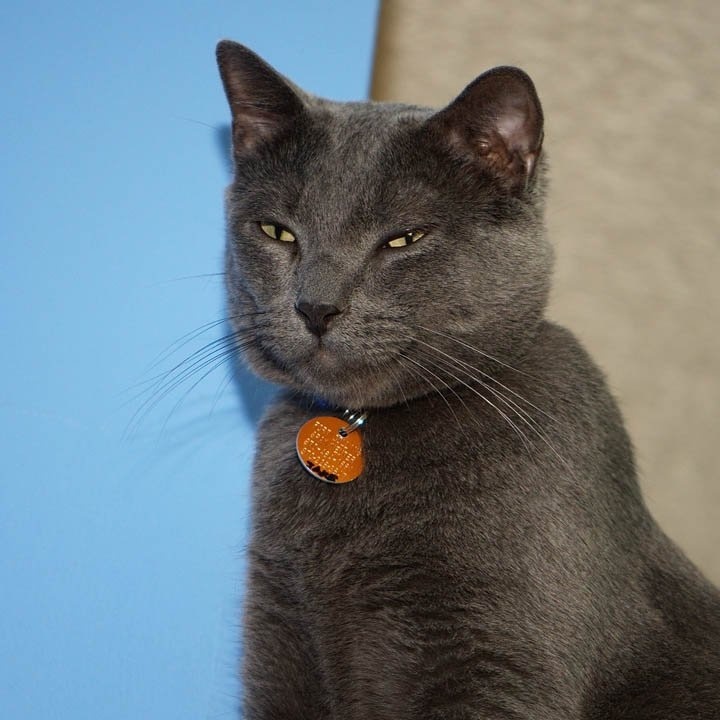 The Fall 2010 issue of Cat's Meow, FCCR's newsletter, mentions that the Korat is considered good luck. The numerous people Jake has helped might feel there is something true to this belief and that this is one very special cat. what a special kitty Jake is! Everybody has a purpose and I am glad that Jake found his! He is handsome too! I agree, special he is fur sure and an inspiration for the rest of us! Wonderful post!!! Jake, you're an inspiration to all kitties looking for a career! What a fantastic boy you are! Jake, you are a wonderful role model for us cats...Teri talks about getting us therapy certified...wonder if she ever will? Thanks for the links, too...that's one thing we like about blogging is finding new blogs that inspire us! Jake, it's so nice to meet such a special kitty! Jake being in a cage is very hard so it is wonderful that you calm down all of the new residents. Purrs Willow. Wow, how cool is that! So glad Jake has found his special place to live where he is valued and recognized for the special guy he is! And the guy is handsome if I do say so myself (I might be biased on theese one!)! Ann, thank you so much for your very sweet comments for us and for your concern and purrs. We appreciate them so much. Wonderful story!! Jake is indeed a very special soul. Yes, he is wonderful! Kittehs need to be very patient with hoomins, but it's so hard! Excellent ~ pets do the soul good. What a sweetie. I love Animal Planet's Cats 101! What a pawsome cat he is. Thanks for sharing his story. What an amazing cat Jake is! What a great story! Jake is a very cool--and busy--kitteh. Nosetaps! Official greeter is a pawsome job! Jake is one cool cat! Korat? He looks more like a Russian Blue to me. Either way, what a lovely cat!